'Peace' is a spontaneous worship CD that bring usher you to a place of peace and meditation. 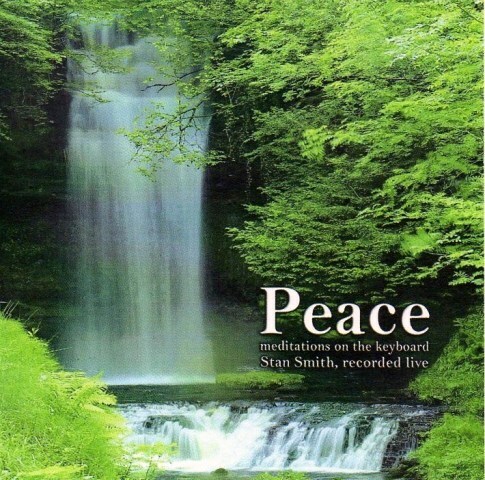 Stan Smith ushers in meditations on the keyboard with the anointing of peace. **THE CD HAS OVER AN HOUR OF SPONTANEOUS WORSHIP MUSIC! GospelSmith is the ministry of Stan & JoAnn Smith of Avila Beach, CA. They have a rich gift mix: preaching, teaching, moving in the gifts of the Holy Spirit, prophetic art and music, and more. Stan Smith has more to say in a minute than some people do in an entire lifetime. What I love about my friend Stan Smith is the way that he is able to bring a whole room of people with him on his journey and ignite passion in the hearts of those listening or those simply reading his books. His book, Prophetic Song: Gateway To Glory, is a personal journey and a personal invitation to sing a new song to the Lord. It is the 'A B C's' of prophetic singing, even if you have never done it before. I promise you will be lifting up a new song before you read the final chapter. I highly recommend this book, Prophetic Song, and his teaching CD's. -- Julie Meyer, International House Of Prayer - KC. Stan Smith is one of the best teachers of the prophetic and worship. His wisdom, insight and humor are fresh bread for the soul. "Stan Smith, a dear brother and friend in the Lord, is a mighty man of God, and since our time in ministry together in conferences and services, I consider Stan to be a very anointed, passionate prophetic teacher and psalmist that anyone would be blessed from. I know from experience in prophetic ministry, nothing substitutes for the anointing of the Holy Spirit, and Stan carries that anointing in all areas of his very accurate prophetic ministry. I encourage you to acquire anything Stan Smith releases and will assure you that God will impart into you a great blessing from receiving His anointed messages and psalms. Please keep my dear brother Stan Smith in your regular prayers, as we know God has years of powerful ministry in store for our nation and world from the voice of His prophetic messages! Stan is a so relaxed in his anointing and revelation that you feel like you are sitting in his living room as a friend. This opens your heart to receive much more form the Holy Spirit. Relaxed reception instead of religious demands. It is very refreshing! I highly recommend anyone to go into his living room and hang out with him wether it be a book, article, DVD, CD or meeting!